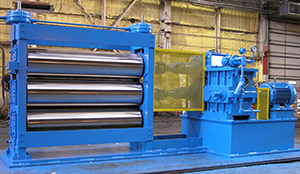 Rolling mill consisting of three rolls or known as 3 High rolling mill is typically used for performing multiple reduction passes by wrapping material around the center mill roll and performing another reduction on the opposite mill roll pair. 3 High mill can also be used with varying mill roll sizes to induce a specific percentage of reduction of material on a single side of the work piece. 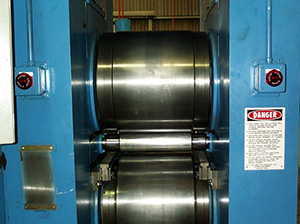 This can be beneficial for cladded materials or for conditioning a single side of strip.